WASHINGTON, DC -- The Organization for Security and Cooperation in Europe is considering sending an armed police mission to help conduct elections in conflict-torn eastern Ukraine, if there is agreement on all sides. 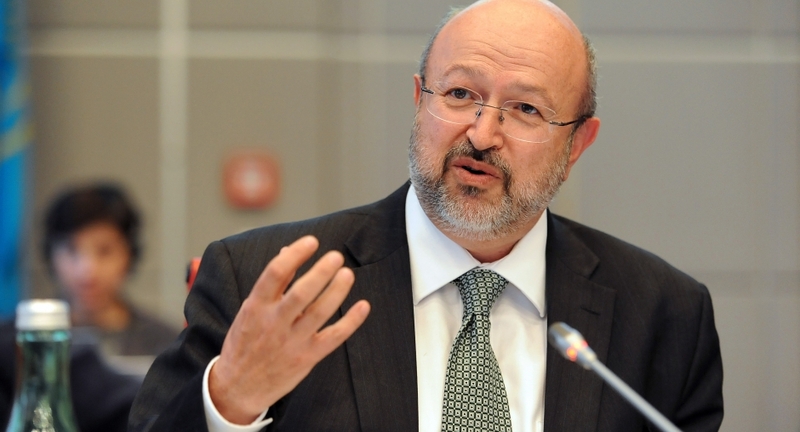 OSCE Secretary General Lamberto Zannier told the Associated Press in an interview Thursday that his group was ready to send hundreds of policemen, potentially armed, to ensure the vote takes place in a secure and safe atmosphere. "It would be a police operation to help maintain law and order in this area and ... to help provide a safe environment for the elections to take place," Zannier told the AP. As part of an internationally brokered peace agreement, Ukraine must hold local elections in two eastern regions controlled by Russian-backed rebels, but progress on ending the two-year conflict that has already killed more than 9,300 people has been slow. Moscow says Ukraine must pass the necessary legislation to conduct the vote. Kiev insists the separatists must first cease all hostilities and pull back weapons and Ukraine must restore control over its border with Russia. The sides are also at odds over the degree of autonomy that will be granted to the separatist regions and the details of a prisoner exchange and amnesty for the rebels. Zannier said the mission, which has been requested by Ukrainian President Petro Poroshenko, could work alongside the local police force in the Donetsk and Luhansk regions to prevent criminal activity and help international observers monitor the vote. The mission would only be able to deploy after both sides fully commit to a ceasefire. "It is a complicated scenario, but it's certainly something that we can do if, as I say, everybody agrees," Zannier said. Russia, however, has spoken against such a mission, with Foreign Minister Sergey Lavrov calling the issue "an artificial problem" and saying unarmed monitors of OSCE would be enough for the vote. Ukranian Ambassador Valeriy Chaly told the AP, "As of today, it is impossible to conduct normal elections." Chaly added: "Russia will continue playing its game and try to do what it wants to do — for Ukraine to have this cancerous tumor. ... This position is unacceptable." When the Terrorist shoot and murder and torture the "police" will Secretary General Lamberto Zannier be tried for the murders shootings and torture of those Police and population he so recklessly placed in the position to be abused?